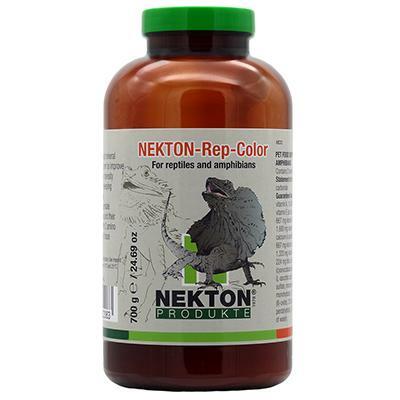 The composition and effect of NEKTON-Rep-Color matches that of NEKTON- Rep, with additional colorants to prevent the color of the reptile fading or to achieve a more intense color. NEKTON-Rep-Color is a high-quality multivitamin compound that matches NEKTON-Rep in its composition, and additionally contains canthaxanthin and apocarotenal. These substances are responsible for coloring the body, among other things and are deposited evenly in fatty tissue, shells and/or skin by administering NEKTON-Rep-Color. 0.25 g NEKTON-Rep-Color per kg of body weight daily, or respectively 1.5 g once a week. One level measuring spoon (inside) holds 1,5 g NEKTON-Rep-Color. NEKTON-Rep-Color should be stored dry and out of sunlight, between 15° and 25° C (59° and 77° F). DO NOT STORE IN THE FRIDGE !! !